Apparatus consists of two coils of wire, one fixed, one rotatable, mounted in series with a common vertical axis. 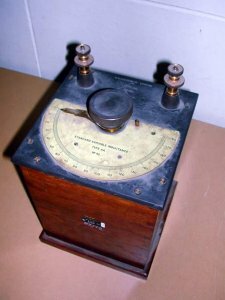 The coils are mounted in a mahogany box, with an ebonite half circle gauge, graduated from 0 to 180 degrees to indicate the position of the inner rotatable coil relative to the fixed external coil. The wire of the coils appears to have been wrapped in silk for insulation. The range of inductance is approximately 5 to 50 mH. At one end of the scale, L=L1+L2-2M ≈ 5mH, where L1,2 are the individual inductances of the two coils, and M is the mutual inductance of the coils. Midscale, L=L1+L2, and at the other end, L=L1+L2+2M ≈ 50mH, so it can be seen that the bottom range of the instrument can never be zero. The instrument is similar in design to the Ayrton and Perry Variable Standard Inductance, first invented in 1895, although it most likely has less loss at higher frequencies due to the decrease in the number of metal parts.